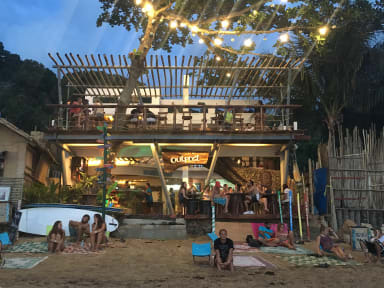 Outpost Beach Hostel i El Nido, Filippinerna : Boka nu! Outpost is one of the best hostels I’ve ever stayed at. They have nightly activities such as beer pong, tequila Tuesday with trivia etc and during the day their island tours is a must!! But it’s the atmosphere that makes this hostel a 10/10. Want food? They have their own restaurant. A drink? Go to the bar! Someone to chat with? Start a conversation with the person next to you or chat with the helpful staff. I basically felt that I never had to leave the hostel, outpost has everything you need! One of my top hostels ever. Great atmosphere and staff, they all knew your name, so personal. Clean and fresh, nice food and drinks. We should have stayed 3 days but ended up for 6. Two of our days we just relaxed at the hostel. Did the A+B tour wich was so fun and nice! But you have to pay 600 extra pesos to get in to the lagoons. The hostel is right on the beach and have the most amazing sunset ever. This hostel is one of the best places we've stayed on at our travels. The staff is amazing and they make you feel like you're a part of the outpost family right away. The hostel arranges great boat tours! They also have fun events every night which makes it easy for you to meet and hang out with new people from all over the world. 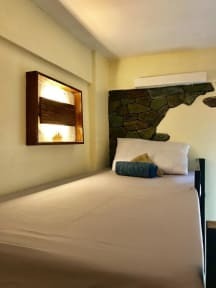 Soft beds, the rooms have great AC. We ate there everyday, they have good alternatives for vegans/vegetarians. We will definitely stay at outpost again! We really enjoyed our stay here. The staff made us feel so welcomed and security staff made us safe. So pleased that we got to spend 6 amazing days here! Pricy but worth it with the facility and personnel. They found the problem with the supposed "food poisoning", it was the water on the tap so they got seperate water for toothbrushing. Good food and good drinks and super freindly staff. Negative is the beach, not a perfect spot to get a tan or go for a swim. But the sunset is amazing! Everyone got foodpoision there, other than that it was amazing! Outpost is great for people traveling alone since it's easy to meet people here. Especially on the boat tours. It's clean and the beds are really nice. I think it's expensive because of the location, even though it's only 10min to town with a tricycle it's nicer when you can walk to things. Still I don't think there's any better place in El Nido because of the atmosphere and cleanliness. One thing they could improve is a system that doesn't require internet for checking out. Outpost has a great social vibe and the location is unreal. The staff is also super friendly. The price however is way to high compared to what you get. The cleanliness in the kitchen is questionalble, I got a food poisoning after four days (the staff were really helpful though). The kitchen is closed between 11am and 5 pm, so no late breakfast or lunch can be ordered. I struggle to find a reason for their price, because nothing motivates it (compared to other great hostels in the Philippines).